What do you think of when you think of Maple Syrup? A plastic bottle with a handle, maybe Aunt Jemima, or the store brand equivalent? That is pretty much all I remember having at the table with pancakes or waffles growing up. We bought it for our kids too, until we started cutting back on foods with high fructose corn syrup. 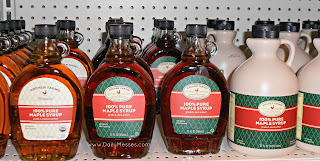 I had no idea about real Maple Syrup, so we did some research when we first started buying it. Apparently what I thought was maple syrup was actually 'table syrup'. How It Is Made: Trees are tapped (usually end of February to beginning of March) to get the sap from Sugar Maple, Black Maple or Red Maple trees. The trees must be 10 inches in diameter or larger before they can be tapped; that's usually around 40 years old! Each tree can yield around 10 gallons of sap (about 1 quart of syrup). (This is only a small percentage of the trees total sap.) Trees that are tapped correctly and kept healthy can be used to collect sap for 100 years or more! Once the sap is gathered, the farmer boils the sap using an evaporator. You could also boil it on your stove, if you were making it at home. The sap starts to become a golden color as it boils down to syrup. It takes 40 gallons of sap to make 10 gallons of syrup! What Can You Use The Sap For? : Of course, maple syrup is the product we are most familiar with when it comes to maple tree sap. However, you can also make candy! When the maple syrup is boiling (234 degrees), you can pour the syrup over shaved ice or packed snow. It will make a taffy like candy over the top of the snow. Pick up with a fork and enjoy! When Is The Sap Collected? : The sap is collected only for a short time, usually around 4-6 weeks. Sap collection begins once winter starts to come to an end, when the snow starts to melt. The nights are usually still freezing cold, but the days are warmer. However, once the weather begins to warm and buds form on the trees, the season is over. If you live in Massachusetts, Vermont, or other states known for maple syrup, many places offer tree tapping tours or events. We have a state park that has tree tapping and syrup making events. What Are The Different Grades of Syrup? : I had no idea there were different kinds of maple syrup. I thought they were all the same. Apparently there are light, medium, and dark amber varieties, as well as Grade A and Grade B. The color is usually determined by when in the season the syrup was made. Early in the season usually makes a lighter color, whereas later in the season will produce a darker color. However, it is also dependent on nature and weather. Grade A maple syrup has more of a mild flavor. Grade A Light Amber: Very light in color. Delicate maple flavor. Grade A Medium Amber: Darker in color. More of a maple flavor. This is the most popular syrup used on pancakes and waffles. Grade A Dark Amber: Even darker in color. Stronger maple flavor. Grade B (aka Cooking Syrup): Very dark color. Has the strongest maple flavor. Also used as a table syrup, as well as baking, cooking, and flavoring. The next time you happen to be a maple syrup state, you can impress your friends with the following terms. 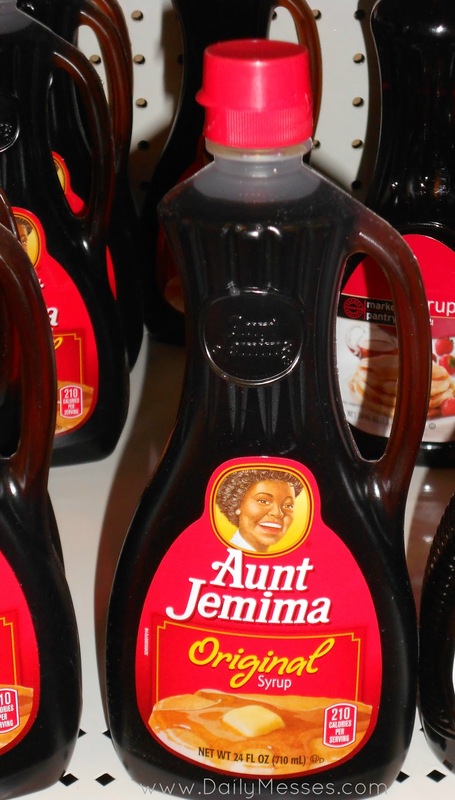 Here are the ingredients for Aunt Jemima's Original Syrup: corn syrup, high fructose corn syrup, water, cellulose gum, caramel color, salt, sodium benzoate and sorbic acid (preservatives), artificial and natural flavors, sodium hexametaphosphate. Here are the ingredients for Maple Grove Farms Maple Syrup (Grade A Dark Amber): maple syrup.